As 2nd Vice Commander, of Zone 2, my duties are to assist and provide an overall review of the Central Area, Southwestern Area, and their Districts, 7th District, 8th District, 13th District, 15th District and the 16th District. I am a strong believer in the Chain of Command, and expect everyone in the Chain of Command to do their duties, to the best of their abilities, for their members. Zone 2, is approximately 235 miles long and 60 miles wide. 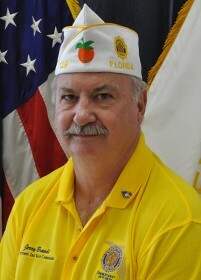 With 81 American Legion Posts, with a number of unique problems within each Post. We have Rural Posts, Posts with large cities, Snowbird Posts, Posts next to military installations, and Posts that are a combination of all the above. Please when a Vice District Commander, District Commander or an Area Commander comes to your Post, assist them if there is a problem, but above all, show the American Legion Friendship with them. They are there to do a job, and they do not get paid for it. I hope to see you at the District meetings in the next few months, I will be attending every District Meeting, if possible, but I am looking forward to meeting with you.